In this third Spice Shop Mystery Piper’s ex mother-in-law gets to spend a lot more time with Piper. You see a dead man has been found at the bottom of Melly’s basement stairs and her home is a crime scene so she is forced to move in with Piper in her apartment above her shop. Of course she could go stay with her son in his McMansion but he his fiancee is doing a bit of redecorating. Then there is the fact that Melly is the prime suspect. The dead man was in town with his partner to buy an upgrade she had designed for their point-of-sale software. It seems Melly is a computer whiz. The fact that the man had died the night before and Melly called Piper first before the police has Chief McBride pretty suspicious. It doesn’t take long for Piper to enlist Reba Mae’s help in trying to find out what really happened. Fall is a busy time in Brandywine Creek with Oktoberfest, high school football and a production of Steel Magnolias at the opera house. Piper is stocking up on spices for all the upcoming festivities, including a huge party featuring German cuisine, her daughter is a cheerleader who is sweet on the quarterback and Reba Mae has been cast to Truvy in the play. Now the have to add a murder investigation. 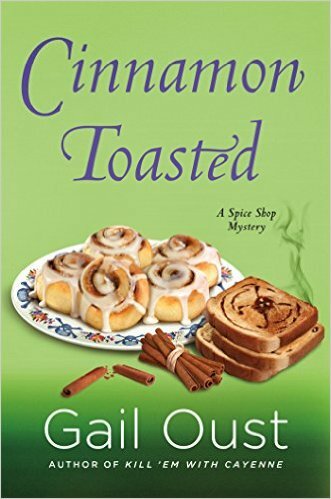 Gail Oust has created a mystery that is spiced up with quite a bit of humor too. Piper and Reba Mae’s hi-jinks will have you laughing out loud. All the characters have grown since the start of the series. It was a joy to get to know Melly better. She really is quite a lady. Piper is so self assured. She has a great relationship with her former mother-in-law and her ex husband too, even though he left her for Amber, a much younger woman. She does struggle with her daughter wanting to spend so much time with Amber but they are pretty close in age. 🙂 Her relationship with Doug, the veterinarian is starting to warm up although she and McBride have a little vibe too. Everyone needs a best friend like Rebe Mae. She follows Piper lead and they get in some crazy situations. With a great plot and subplots that work Oust has given us an upbeat story cozy readers will truly enjoy. We learn more about spices too. There is also a gingersnap recipe in the back of the book I can’t wait to try. Cinnamon Toast sounds wonderful. Thanks for the chance to win. Sounds like a yummy read. That cover looks delicious. Thank you for the giveaway. Cinnamon Toasted sounds fantastic!! I must play catchcup with this series!!! Congrats on the series! Sounds like one I will be checking out! Sounds like another great book! Love the spice shop mysteries! This one’s making me hungry this am. Really like this series. I don’t think I’ve read this series before… So this would make a very good start in my following it. Thanks for this delightful feature and great giveaway. That cover is sinfully yummy. I’m looking forward to reading this series. Sounds like a great read. I signed up for the Cozy Challenge this year. This sounds like one I would like to add to my list. Thanks for a chance to win a copy. I love the cover and the book sounds like fun. What kind of friends fit “maybe it’s a dead body,” into the middle of a golf game? Well, it gave you a new career that seems to have paid off well for you. I love the title and cover of this book. “Cinnamon Toasted” sounds like a wonderful read and I’m adding it to my TBR list. Thank you for the synopsis and your thoughts on this book. What an interesting book! Love the titles in this series. How have I missed this series? I think I would love it. And what a cute cover. Thanks for the giveaway. This looks like a great series. Like the setting being a spice shop. Can’t wait to read.